Alcoholic drinks are among the daily consumed beverages. Studies have shown heavy alcohol consumption may lead to various forms of liver diseases and to increased mortality rates. 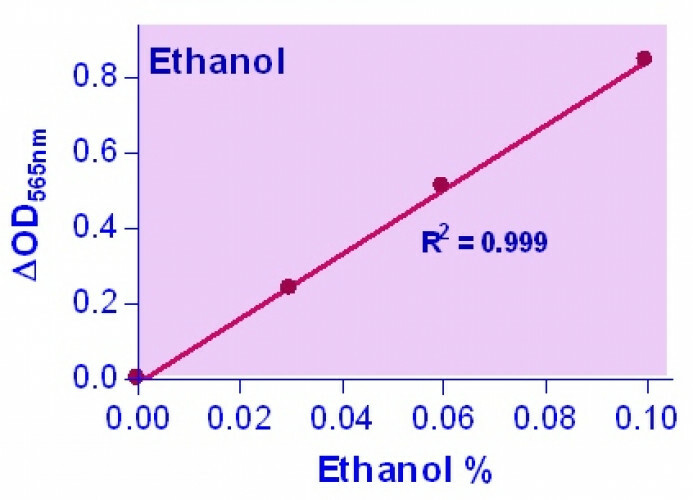 Quantitative determination of alcohol (ethanol, C2H5OH) has applications in basic research, drug discovery, clinic studies and in the alcoholic industry. Simple, direct and automation-ready procedures for measuring ethanol concentration are very desirable. BioAssay Systems’ EnzyChrom™ ethanol assay kit is based on alcohol dehydrogenase catalyzed oxidation of ethanol, in which the formed NADH is coupled to the formazan (MTT) chromogen. 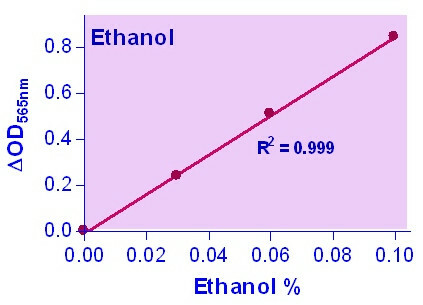 The intensity of the product color, measured at 565 nm, is proportionate to the ethanol concentration in the sample. Applications For quantitative determination of ethanol and evaluation of drug effects on alcohol metabolism. References Assay: Ethanol in Mouse serum (Pubmed).